With one hand on the clutch, the other on the throttle, my left foot balanced precariously on the ground, and my right foot on the rear brake to keep the motorcycle from rolling back down the cobblestone incline, I attempted what must have felt like my hundredth start up the road — wet, black, and shiny from a fresh rain. Other motorists swirled around me, looking curiously at me with muffled laughter in their eyes. Trucks, buses, and all manners of threatening traffic barreled past me and my Honda Twister, which was struggling to put up a good fight against the formidable road. Finally, with a quick release and a pull on the throttle, my little bike shot forward, tires riding rough against the cobblestones. I sped up to catch up with my group, unskillfully dodging stray dogs, children, meandering tourists, and narrow aqueducts running through the alleyways. 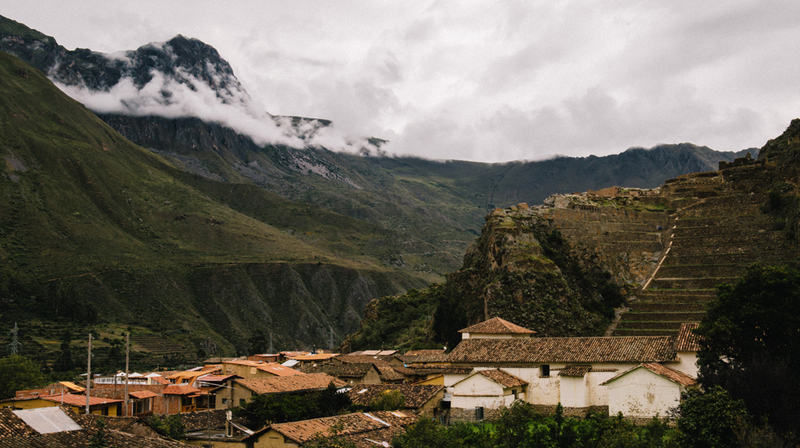 My heart hammered against my chest while my teeth rattled all the way into the central square of Ollantaytambo, a small Inca village frozen in time. At long last, when we finally parked our bikes in front of a quaint local’s café, I took my helmet off, let out a shaky breath, and glanced quickly into the rearview mirror. The reflection of a huge, dopey smile on my face greeted me back. Every year I have the incredible fortune of traveling with a crew of awesome people; new and old friends alike, from a company I used to work for. The group had already been to Vietnam, Mexico, and the Philippines. 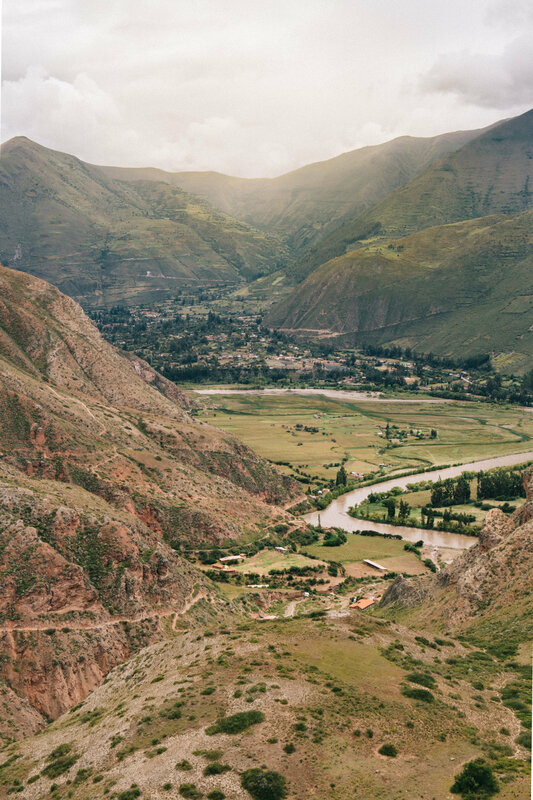 For our fourth year running, we chose Peru, a country renowned for its ceviche, Pisco Sours, and, of course, the iconic Incan citadels of Machu Picchu. But, perhaps, what goes less experienced in Peru is its lush countryside as seen on a sport bike. Touring a different country on a motorcycle has always ranked high on my bucket list. A week before the trip, I reached out to Peru Moto Tours to reserve two spots. It didn’t take much to convince my buddy and fellow motorcyclist, Aaron, to come along for the ride into the Sacred Valley: a picturesque and historical valley situated in the Andean highlands of Peru, about 15km north of Cusco. After I put a deposit down for the reservation, all there was left to do was count down the days. Our friend, Alani, decided to join Aaron and I at the very last minute on Wednesday morning as we walked out from our hotel in Cusco. Throwing on my jacket, I glanced up nervously at the sky. The day was already cloudy, and there was a slight chill in the air; some rain and possible thunder in the forecast. At the front of Peru Moto Tours laid a small army of motorbikes, four of which were already parked and warming up right on the curb; the sound of their syncopated engines thrumming down the street. After signing our waivers, we met our route guide Juan, a Cusco native with an accented and slightly shy way of speaking. 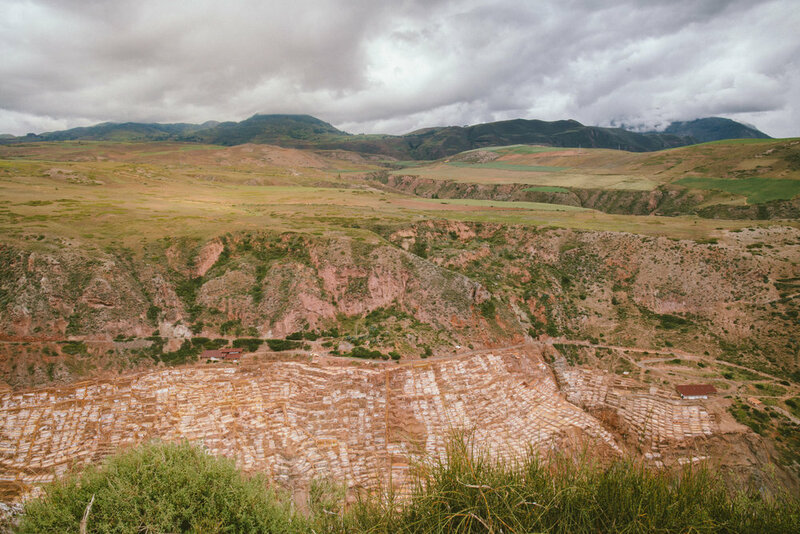 He gave us a brief overview of the journey ahead: 250 total km of asphalt and dirt roads through river valleys and Incan ruins, villages and artisanal markets at a max altitude of 12,500 feet. “Because of the elevation, you will need to pull back on the throttle very hard at times,” he advised in a fatherly way, as the three of us sat in anticipation on our bikes, ready to gas it out of town. Getting out of Cusco was a bigger challenge than expected. Narrow alleys cloistered me in close to cars and buses. Rough and uneven streets threatened to throw me off balance at any moment. Stray dogs , which there are many in Peru , trotted out into the road, occasionally trying to nip at my feet as I passed them. But when we finally rode past the outskirts of the city and onto a proper byway, I could feel the tension in my body dissipate; my grip relax as I followed the long stretches and rhythmic bends of the road. We rode a leisurely pace high up over the valley. A panoramic view of the region’s two most prominent mountains, Sahuasiray and Veronica, lay ahead; their summits partially covered by low-hanging clouds. We weaved through the valley, traversing its hillsides as the road ascended and descended in a somewhat predictable cadence. It was a style of riding I wasn’t quite used to: the constant shifting and speed adjustments, the hair-raising turns; sharp and tight against menacing rock walls. The entire ride was inundated with incredible sights: rising fortresses of rock, waterfalls tucked away in the foothills, sunshine the color of amber and honey; dappling the valley floor, highlighting the villages and ruins below. 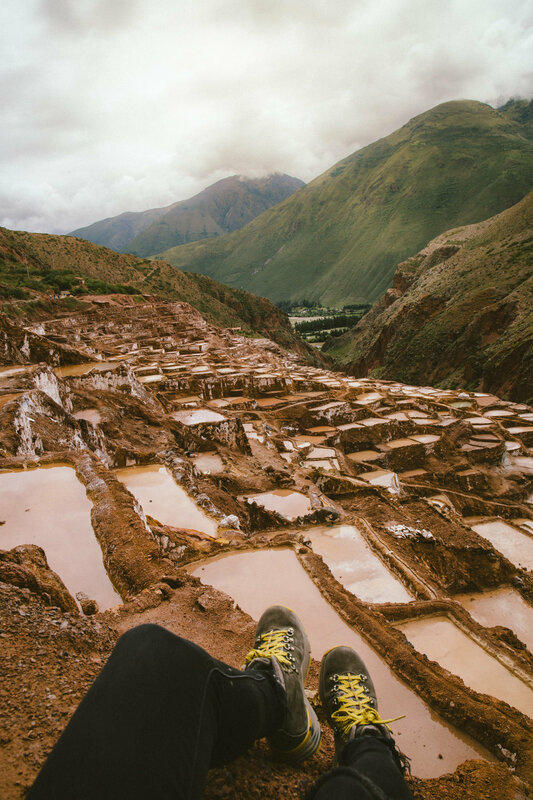 At one point, we rode off the asphalt and onto the dirt towards Salineras, where terraced Inca salt ponds could be found, nestled in the valley. The dirt road stretched infinitely towards the horizon and the lush foothills seemed to move apart, as if to gently usher me into whatever lay beyond. It’s a moment I’ll remember forever: beating up clouds of dirt behind me, I felt free. When I try to think of how to describe the beauty of the Peruvian countryside, the words that come to mind could never do it justice. It’s a place of light, depth, shadow, contrast, and glorious color; the kind you often only witness in your wildest dreams. And what Alani, Aaron, and I felt on this trip was equally beyond the ordinary, as the roads took us through scenes we had only seen in movies: the canyons and gorges, artisanal salt mines, and quaint little Peruvian towns that seemed to welcome us in with a smile and a steaming cup of café con leche. 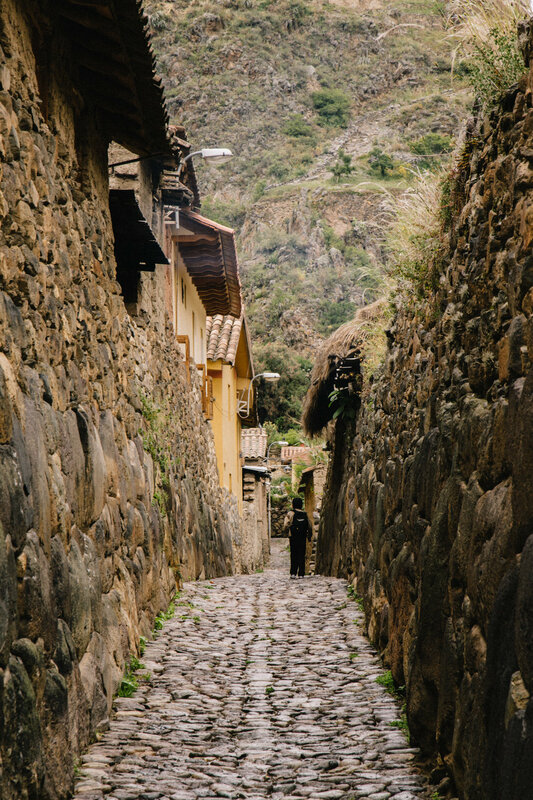 When we finally left beautiful Ollantaytambo that day, going the same treacherous way we came, I felt capable of anything. CHARLEY ZHENG was born in Shanghai and bred on the West Coast. She is a Portland-based photographer with a storyteller’s spirit.